This beautifully-textured Wrought Iron Twisted Ring Gate Latch, is handcrafted for strength and durability, by skilled blacksmiths in our New England forge. 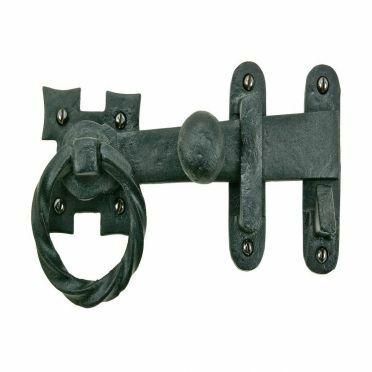 Wrought Iron is a wonderful and practical choice for updating your door or gate hardware. 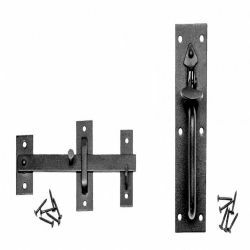 Only the finest quality materials are used, that will stand the test of time. 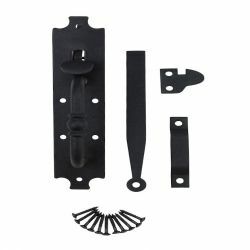 This latch will open your gate or door from both directions. 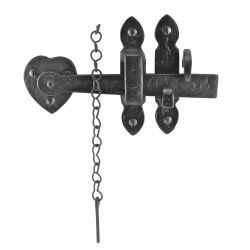 Sold individually, with all the needed mounting hardware included, this latch's overall Width measures 7 inches, and the overall Height is 3 inches (measured at the 'keeper'). See our 'Measurement Table' below for a complete list of dimensions.